This is the ceiling above the staircase in the Palau de la Virreina, a palace featuring a fusion of Baroque and Rococo motifs, located on La Rambla in Barcelona. The residence was designed by local architect Joseph Ribes for Manuel de Amat y Juniet - a distinguished figure on the Spanish political scene and a viceroy of Peru. The Palace was completed in 1778 and occupied by the Viceroy and his wife until his death, a short time later in 1782. Over the years, the Palau de la Virreina has housed numerous organisations including the Museum of Decorative Arts, the Cambo Art Collection, the Postal Museum, and the Numismatic Office. Today the palace is home to the City Council Department of Culture and features two separate gallery spaces: one for contemporary mixed media exhibitions and the other used primarily for photography. 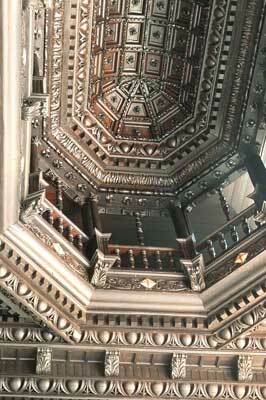 The ceiling is an impressive wooden coffer, surmounting the staircase of the palace, carved by Antonio Carbonell in the middle of the 16th century. It takes the shape of an inverted vessel and includes a balcony surrounded by a balustrade. The richly carved ornamentation of leaves, rosettes and flowers, framed by scrolls and volutes, is typical of the Rococo style. Although Rococo styles, by definition, are predominantly asymmetrical, this ceiling is entirely symmetrical. In this way it takes inspiration from the Baroque period that favoured equal, balanced architecture in opposition to Rococo's jocular, florid approach. The combination of Baroque and Rococo exhibited at the Palau de Virreina is unusual to see in Barcelona. It is one of La Rambla's cultural high points and well worth a visit. If not for its carved ceiling then for the main facaade - beautifully decorated with pilasters and a large balustrade.